Welcome to Mrs. Valenzuela's website! Please click on the tabs above to navigate around the website. Hello! 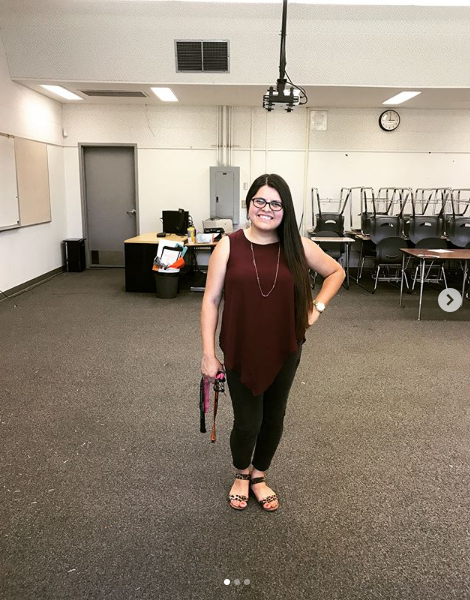 My name is Mrs. Selenni Valenzuela and I currently teach at Merced High School (Go Bears!). Teaching has always been my career dream, since I was in sixth grade in fact, and it feels good to be living it. Education has always been a huge part of my story. Since kindergarten, my parents always pushed my siblings and I to do well in school. They never received much of an education in Mexico, considering they had to work and help their family, so they emphasized the importance of education from the start. I graduated from Le Grand High School and went on to UCLA for my undergraduate, where I majored in English and minored in Chicana/o Studies and Education. During my time at UCLA, I was lucky enough to travel abroad to London and Stratford-upon-Avon in England where I studied Shakespeare in the homeland of the man himself. After UCLA, I worked as the Secretary for the Department of Curriculum and Instruction in Delhi, where I also taught for my first year. I will now be going into my third year with MUHSD. In regards to my personal life, my supportive husband and vivacious 1.5 year old daughter keep me incredibly occupied once this teacher clocks out. During free time, my husband and I love to attend bailes and enjoy our Mexican heritage while we dance the night away, and we love taking our daughter to the park just as much (she runs around like a free bird, which leads to a nap, which is secretly the real reason we take her). It is important to note that I love sports, despite not having enough time to follow them, and I am a huge San Francisco Giants fan. The Niners and Lakers also hold my loyalty. And that's a tad about Mrs. V! My Family, including siblings and parents. On our wedding day with my stepdaughter Kaylee!